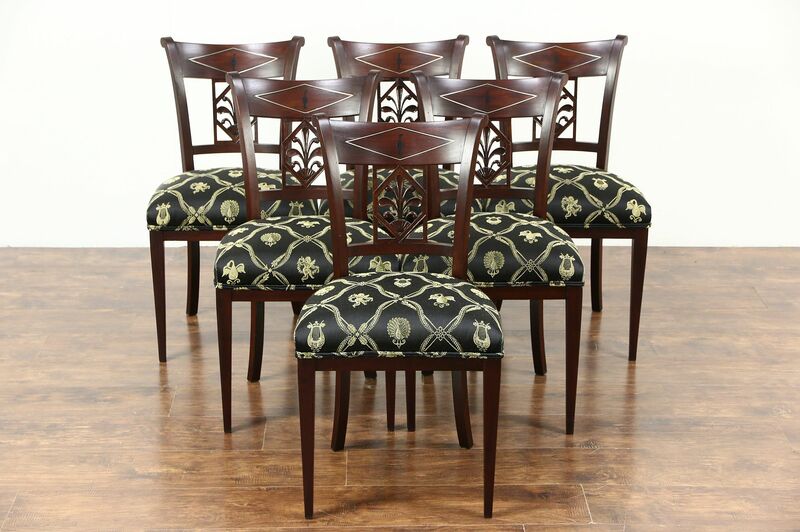 A set of six solid mahogany Empire dining chairs were hand carved in France during the about 1820 and are signed by famed cabinetmaker, Jean Joseph "Chapuis." Chapuis was born in Brussels in 1765 and died in 1864. Trained in Paris, he was an important maker of furniture in the Empire style. Reglued to be sturdy for another generation, the solid mahogany frames are inlaid with ebony and silver. The restored finish is in excellent condition and upholstery is new on this elegant antique furniture. There have been various restorations over the centuries. Size is 18" wide, 18" deep, 33" tall, seats are 19" high and 14" deep.